Polish transmission system operator (TSO) PSE recently announced that 4GW of offshore wind capacity could be built in the Polish Baltic Sea by 2027 and double that in the longer term, helping to fuel a growing sense of optimism in the country’s nascent offshore wind sector. PSE’s announcement follows other developments moving Poland closer to putting steel in the water. In March, Norwegian energy firm Statoil said it was buying 50% stakes in offshore wind projects totalling 1.2GW being developed by energy group Polenergia. In the same month, Polish state utility PGE began a two-year wind measurement campaign for a planned 1GW project it intends to implement by about 2025, part of the 2.5GW in offshore capacity the utility wants to see online by 2030. Polish oil refiner PKN Orlen also got into the game this March, launching a tender seeking the development of a preliminary technical concept for up to 1.2GW in wind farms in the Baltic Sea. "The Polish offshore wind pipeline is starting to shape up," says Søren Lassen, offshore wind analyst at Make Consulting. "There are projects with grid-connection agreements and environmental impact assessments that are situated in favourable areas in terms of distance from shore, water depth and wind speeds." Nine offshore sites in the Polish Baltic Sea are currently in the pipeline, according to industry players. The most advanced are Polenergia’s Baltyk Srodkowy 2 and 3 projects, both planned for a capacity of around 600MW. Baltyk Srodkowy 3 was awarded an environmental permit in August 2016, followed by Baltyk Srodkowy 2 in April 2017. Statoil’s decision to buy into these projects was seen as a sign of foreign investors’ confidence in the country’s offshore wind prospects. Statoil and Polenergia also agreed to set up a 50:50 joint venture to advance the two projects towards future auctions and final investment decisions, with Statoil acting as the manager for development and potential construction and operational phases. Statoil is already developing the 385MW Arkona offshore wind farm with E.on, currently under construction in the German Baltic Sea. "The more experienced developers, who have driven growth and cost reductions in offshore wind in western Europe, are looking to new markets. And because competition has intensified in established European markets and is already picking up in the US and Taiwan, European markets like Poland emerge as interesting cases," says Lassen. The rapid decline in offshore wind costs has, in turn, made these emerging markets more inclined to develop wind projects off their coasts, as has the development of offshore projects nearby, he adds. Optimism is also being driven by indications that the regulatory backdrop is improving. The Polish government — whose electoral platform included plans to promote the coal industry — appears to have come around to the idea that the country will be unable to reach its targets for renewable energy and emission reductions without energy sources such as offshore wind. Evidence of the government’s evolving approach can be found in the setting up of a parliamentary commission on offshore wind in November. Commission chairman Zbigniew Gryglas, of the governing nationalist Law and Justice party, called for a national programme for offshore wind, citing the economic boost its development could bring the country. According to a frequently quoted 2016 McKinsey & Company study, the development of 6GW of offshore capacity in Poland — the 2030 target set by the Polish Wind Energy Association (PWEA) — could create some 77,000 new jobs and contribute about PLN 60 billion (€14.1 billion) to the economy. To help get the sector moving, the Polish parliament is expected to approve a proposal allowing offshore projects to compete in tenders once they get environmental approval, rather than wait until the final building permit is secured. This is one of a series of amendments being considered to the government’s 2015 Renewable Energy Act as Poland looks set to fall short of its 2020 target to generate 15% of energy from renewable sources. The government is also as seen softening its hard-line stance against onshore wind, which led to just 41MW of new capacity coming online last year, to reach a total of 6.4GW. A tender for some 1GW of onshore wind is expected later this year. A tender for offshore projects could follow, perhaps as early as next year. Poland is well prepared to develop offshore wind, according to Janusz Gajowiecki, president of PWEA. In addition to being able to piggyback off cost reductions, technological improvements and best practices developed in the North Sea, the country has already developed a sizeable supply chain for offshore wind, he says. Poland’s strong and extensive port system is also seen as offering significant growth opportunities for operation and maintenance of offshore wind farms. "There are already about 80 Polish companies supplying the offshore-wind chain outside of Poland, so starting today you would already be able to supply about 50% of components locally," says Gajowiecki. " When offshore wind got started in the UK, it had a much lower percentage. This give us a real competitive advantage." 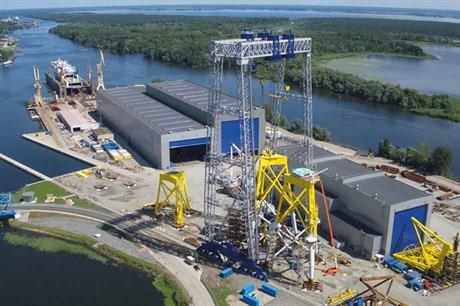 Among established Polish suppliers is GSG Towers at the Gdansk shipyard, which first began producing towers for onshore wind when the country’s onshore wind business began to boom and is now a major offshore player. In cables, Tele-Fonika Kable last year expanded its offshore footprint with the acquisition of UK-based group JDR Cables, a supplier to offshore wind projects including the 1.2GW Hornsea Project One. Bladt Industries Polska, the Polish arm of the Danish provider of offshore wind substations and foundations Bladt Industries, got started in Danish offshore wind after its establishment more than 15 years ago. Gajowiecki highlights the benefits that could come by pursuing a common approach to offshore wind with other countries surrounding the Baltic Sea, where WindEurope figures show 1.85GW in offshore capacity is already installed in Denmark, Germany and Sweden, with further projects under construction and permitted (see map, below). The European Commission is spearheading efforts to do that, and PWEA — along with wind associations from Denmark, Estonia, Finland, Germany, Latvia, Lithuania and Sweden — last year signed the Baltic Sea declaration, calling for regional cooperation in spatial planning, grid development, capacity planning and support schemes. PSE president Eryk Klossowski has indicated the TSO is assessing offshore-wind investment plans, evaluating grid-enforcement measures to transmit power from the Baltic to the central part of the country, and considering additional cross-border interconnectors with Denmark, Sweden and Lithuania. The fact that the TSO is clearly gearing up for offshore wind has encouraged investor optimism.